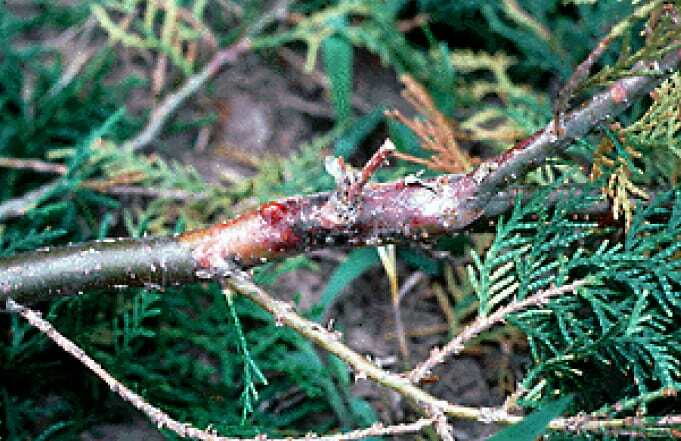 Canker diseases result in the formation of distinct, sunken lesions on the bark of woody plants and occurs on Oriental Arborvitae, Bald-cypress, Arizona, Italian and Leyland cypresses, and occasionally Junipers..
Cankers restrict water and nutrient movement and may ultimately lead to branch dieback and tree death. The symptoms for this disease are frequently confused with winter-related injuries. Symptoms of the disease are similar to Botryosphaeria canker. Elongated, flattened cankers form on small branches and main stems. Bleeding or resin formation in cankers is common. Multiple coalescing branch and stem cankers may cause branch dieback, or in some cases, tree death.